Crude prices are up this morning at $48.40, gaining $.51 (1.06%) since closing yesterday. Prices soared higher yesterday in repose to the API inventory report, posting their largest percentage gain (3.08%) of the year, and the second largest absolute price gain ($1.43). Prices this morning are slightly down ($.11) from their opening price this morning, as markets await confirmation from the EIA inventory report today at 10:30AM. Today’s opening price of $48.51 was the highest price since June 1. Diesel and gasoline prices both rose in line with crude’s surge. Diesel gained nearly 5 cents (3.2%) to reach $1.5672, while gasoline picked up just 3.65 cents (2.3%) to reach $1.5962. Diesel has shed .2 cents this morning, while gasoline has shed a more substantive .6 cents. 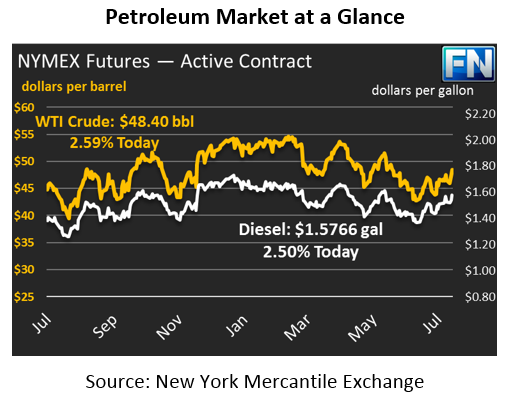 Markets were driven primarily by yesterday’s API inventory announcement that crude draws were 10.2 MMbbls last week. While markets have seen steep inventory drops over the past few weeks, the largest draw so far this year was 7.6 MMbbls two weeks ago. Declining imports (particularly from Saudi Arabia, which reached seven year lows for this time of year) and high refinery input rates helped draw down crude inventories. Gasoline struggled to keep up with the market gains yesterday, given the surprise inventory build. If the EIA’s inventory report confirms the massive crude draw, markets will likely rally again today, putting us close to (or even surpassing) the $50 mark for WTI. Further helping the market was the UAE, which echoed Saudi Arabia’s pledge to reduce exports in August. Saudi Arabia announced earlier this week that they would limit exports in August to 6.6 MMbpd. Now the UAE is indicating they will cut their exports by 10% in September to boost their compliance, which has averaged just 71% since the deal began in January.